We can hear the moans and groans coming from the other room. There's only one explanation. The zombies have gotten in. After the zombie apocalypse happens (and we all know it will), there will be two types of survivors. The ones who barricade themselves in malls or houses stockpiling food and never trusting anyone, and the hunters. The zombie hunters will be like the outlaws of the apocalypse. They'll roam through cities and countryside smashing undead skulls and taking names. They'll be exceptional fighters, bashing in zombie brains with even the most unpractical of household items. Their undead kill count will be impressive. Their methods of execution, awe-inspiring. They may even occasionally defend those poor souls stuck in barricaded storefronts. After all, these hunters are survivors too, just a bit more equipped to handle the undead.. So if you're preparing for a long arduous career as a zombie hunter, you better start stockpiling weapons now. And while you're at it, you better get some pretty cool clothes to go with it. 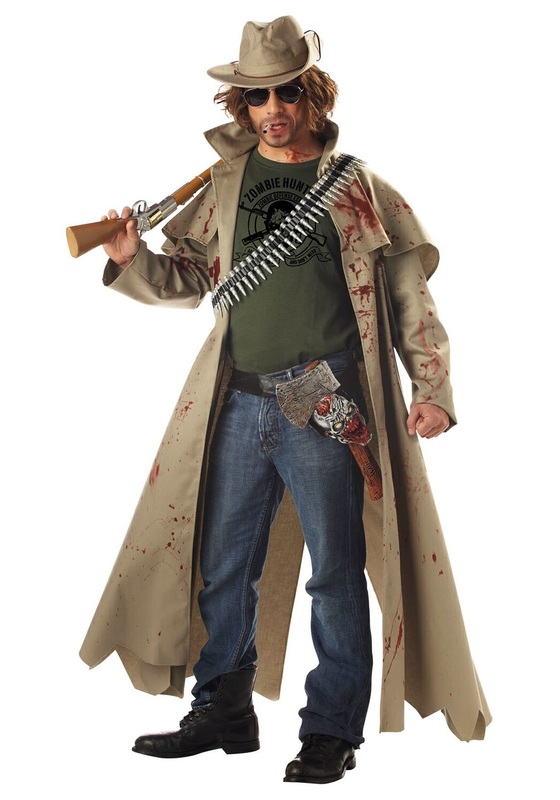 Consider our Zombie Hunter Costume. It comes with a "Zombie Hunter" shirt, trench coat, and safari hat. There's even a plastic ax with belt sheath, and bullet belt. There's a little wear and tear already thrown in for the authentic apocalypse look, but feel free to add some gore of your own. And in the mean time? Happy hunting.